This vanity is a great way to add modern style to your bathroom. Its beautiful white artificial stone counter and brown fiberboard base bring a great new look into your bathroom. Redo the style of your bathroom with this classic from Wyndham Collection. For some added modern style in your bathroom, choose this beautiful vanity. This piece comes with a beautiful brown fiberboard base and a white artificial stone counter. There's plenty of space for items in this vanity's drawers and double-door cabinet. This classic set from Wyndham Collection will make your bathroom look brand new. 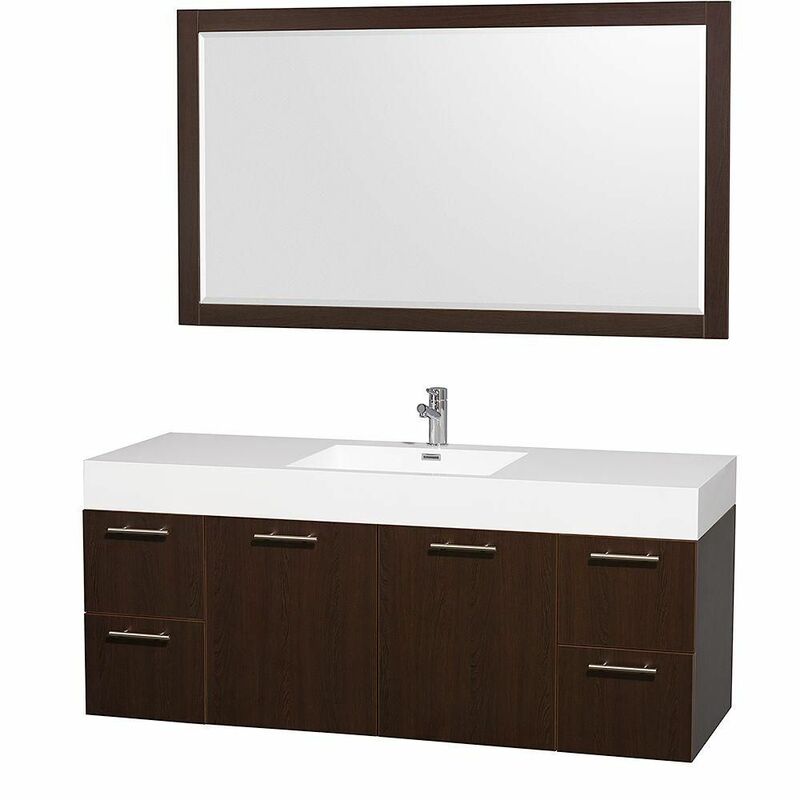 Amare 60-inch W 4-Drawer 2-Door Wall Mounted Vanity in Brown With Acrylic Top in White With Mirror Add this vanity to your bathroom for more modern style in your home. Its comes with a nice white acrylic counter and brown fiberboard base for strength and style. The simple look of the double-door cabinet and drawers is useful and classic. Put a classic feel in your bathroom with this good-looking set from Wyndham Collection. Amare 60-inch W 4-Drawer 2-Door Wall Mounted Vanity in Brown With Acrylic Top in White With Mirror is rated 2.6 out of 5 by 5. Rated 3 out of 5 by Vicky from The vanity is nice, but the mirror was delivered with... The vanity is nice, but the mirror was delivered with broken frame. Rated 1 out of 5 by designer from Client purchased 2 of these vanities. In both cases the drawers do not line up and cabinet pro s... Client purchased 2 of these vanities. In both cases the drawers do not line up and cabinet pro says normal built in adjustments will not correct. Rated 3 out of 5 by lisvein from We love the look of this vanity and love the soft closing drawers!!! We also like that it came w... We love the look of this vanity and love the soft closing drawers!!! We also like that it came with a matching mirror. However, the resin material is easily scuffed/scratched and, the sink doesn't have enough slope so gunk gets stuck out in the corners very easily. Rated 5 out of 5 by LawnWalkerFL from Looks great in my new bathroom, was easy to install. Looks great in my new bathroom, was easy to install. Rated 1 out of 5 by kke from I will not buy from this manufacturer again In general, the construction is as expected - this is a laminated particle board cabinet. What I like is the simple style. What lost me as a customer - lack of customer service. I recently reached out to them to see if it was *possible* to purchase a replacement door for a damaged cabinet door. This is a simple question and should only require a Yes / No response and possible referral. Instead, after a week of communication, and no answer on if *even* possible, Wyndham told me "my information is not valid in their system" and that I should contact Home Depot. As a consumer, I have no insight, or concern, to how my purchase comes into their system from their distributors. I provided Wyndham my Home Deport purchase receipt as requested - this was not sufficient for them to help me. I still do not have an answer. If you purchase this brand, do not expect repair, replacement or even customer service.